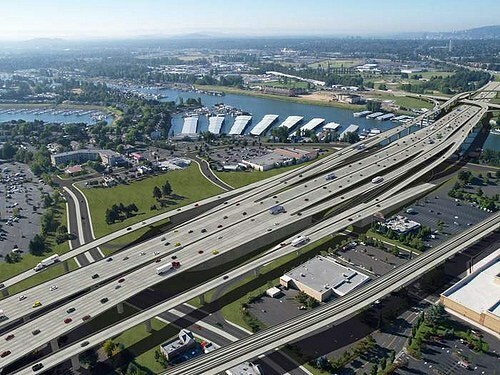 Latest Updates – No More Freeway Expansions. RJ Sheperd using his testimony to ask for a moment of silence for the sixteen year old hit and nearly killed by an automobile while crossing the ODOT-owned arterial, 82nd Avenue. All y’all showed up. 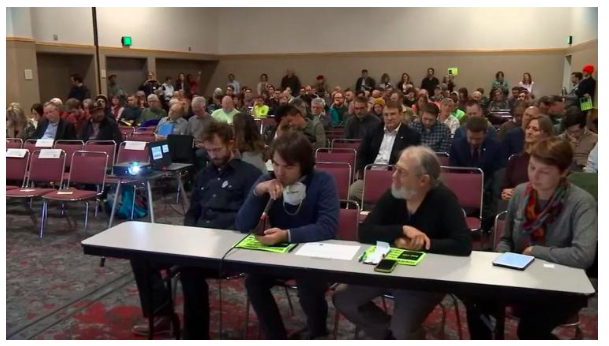 Depending on the news source you trust, somewhere between 100-200 people were at the hearing on Tuesday, and the overwhelming majority of people were in opposition to this project. From our graphic designers to our neighborhood parents, our engaged teachers to our traffic planners, our sign-wavers and our climate advocates – we couldn’t have done it without you. We ain’t done yet, but this Tuesday’s hearing felt like an important moment for our campaign. We’re going to need your help through the final two weeks, but let’s just acknowledge: we took over that meeting. Sincere gratitude to you all – what an excellent accomplishment representing all that we’ve worked on for over 18 months of organizing. 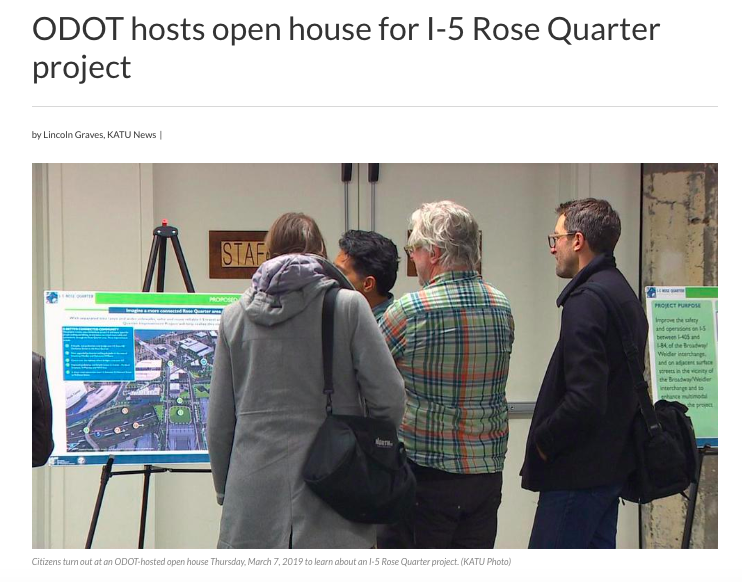 “At least a hundred concerned citizens gathered at the Oregon Convention Center on Tuesday evening to give the Oregon Department of Transportation their opinions on expanding Interstate five through the Rose Quarter. The hashtag for our event (thanks, Sarah Iannarone, for coining it!) 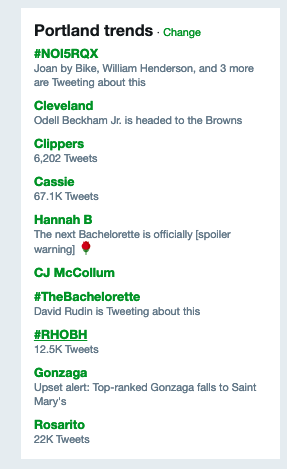 trended on twitter during the public hearing. 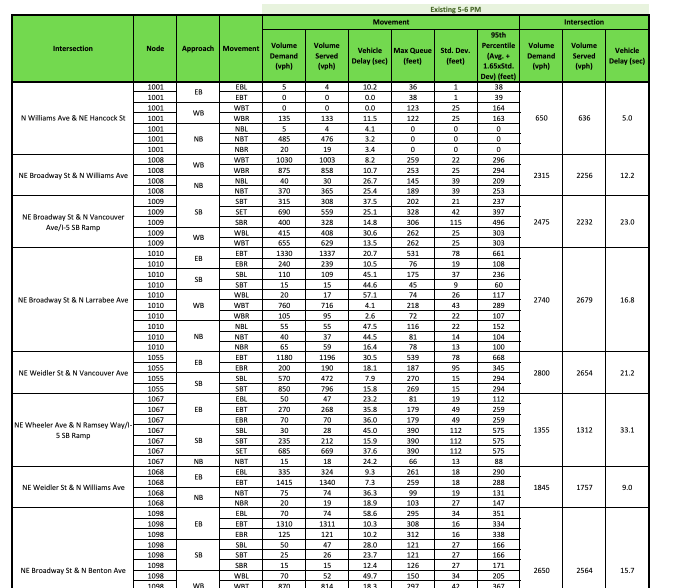 26 days after ODOT released their incomplete version of the Environmental Assessment, and after sustained pressure from our organization, the agency finally released the numerous technical charts and data sets that should have been included in the EA in the first place. Despite the 100 pages of flowery images and greened-up renderings, the EA released in February was missing the actual quantitative data that demonstrates ODOT’s ability to accurately assess the impact this project would have on traffic congestion, carbon emissions or air pollution. Our coalition is eagerly looking through the data sets and determining if we have all of the data necessary to complete our independent analysis, and will conduct what analysis we can in the 18 days remaining in the Public Comment period. Stay tuned. Our favorite comment submitted this week comes from Microcosm Publishing, a small business in the Eliot Neighborhood near the Freeway Expansion:I am a retail business owner in the Eliot neighborhood with an on-site staff of 12, at least eight of whom at any given time commute daily by bicycle, transit, and walking across the area affected by the proposed I-5 expansion project. Of these, several also suffer from severe asthma. Part of our business is open to the public, and the majority of our customers arrive without cars. 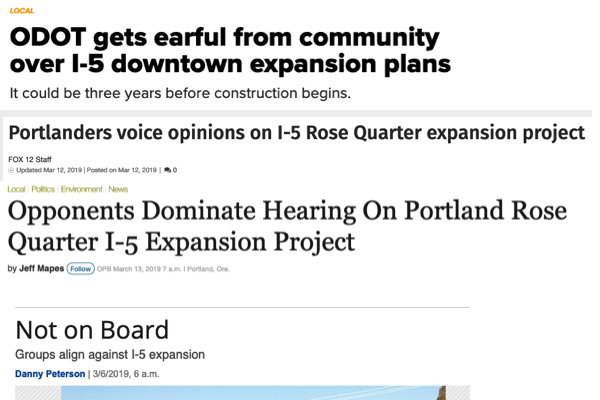 We all suffer the deleterious effects of proximity to I-5.The impact of the proposed Rose Quarter project, including both the construction and the existence of the finished project will result in decreased transportation options and an increase in traffic as well as air and noise pollution that is all already well above tolerable levels. Want to submit your own comment? We need you on the record! Check out our website where we’ve got tips on what to say to have the most impact. We spent about $300 making Tuesday happen. Can you help us cover our expenses? Our community driven campaign is a labor of love, and every dollar you can spare is a dollar we can spend turning out public comment during these final two weeks. Thanks to all of you who have given already, and thanks to those of you who have given your time, energy and support. Tuesday’s event was possible because of people like yourself, and we’re hoping to pull a few more tricks from our sleeve in these final few weeks. Donations are tax deductible! Rally and Hearing on Tuesday at Oregon Convention Center! Tuesday’s the big day! 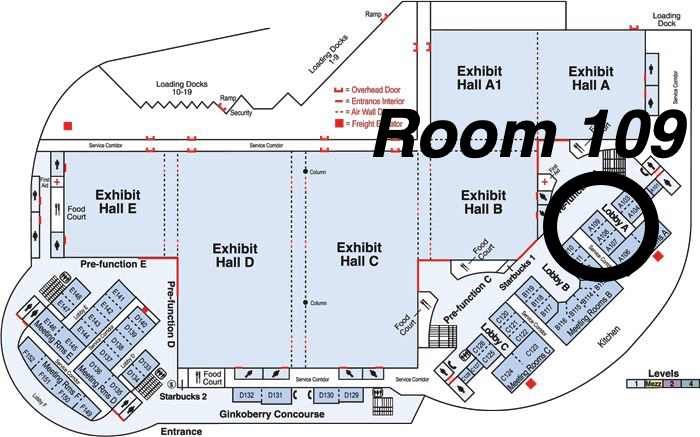 We’re having a short rally at 4:00 at the Oregon Convention Center before lining up to sign the testimony sheet which ODOT will put out at 4:30. We’re still putting together our last-minute plans for the event – be sure to check out our facebook event page/twitter for all the latest information. We understand it’s a work day, and we hope you’ll join us whenever you can! ODOT is removing the sign-up sheet at 6:00pm, so if you plan to testify you need to be at the hearing before then. We’ll have fliers, stickers, new buttons, magnets, copies of Sarah Mirk’s new zine about us, information on how to testify, and posters to distribute. The legendary Paul Rippey is rumored to be making an appearance! If you can’t make the event, we’ll post the link to a livestream video of the hearing on social media if ODOT provides one. Thanks to all who came to Wonk Night! 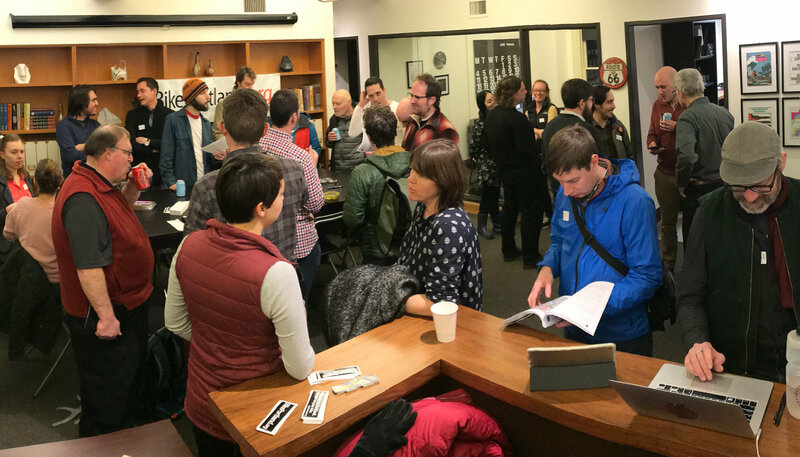 Thanks to BikePortland, The Street Trust, Lancaster Engineering for hosting the “Wonk Night” last week, and thanks to the dozens of individuals who attended! We’re thrilled to see so many people showing up to dig into the technical details of the Environmental Assessment document that ODOT has provided and point out some of the critical flaws about the proposed designs. 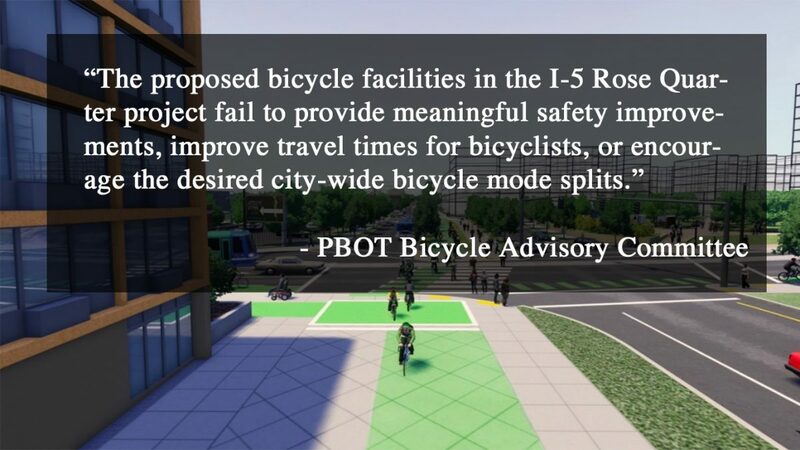 Check BikePortland.org for a recap of the findings from the community review of the document. Thanks to all the community members who turned out for ODOT’s Open House! Our campaign got a little time to make our case on KATU, with reporter Lincoln Graves noting “we couldn’t find anyone in attendance willing to speak on the record in support of the project.” We’re a little bummed to see that the news station somehow managed to spend two minutes talking about a freeway widening and not mention climate change once in the entire news brief, but hey, we’ll do our best to hammer the issue home at the public hearing on Tuesday. 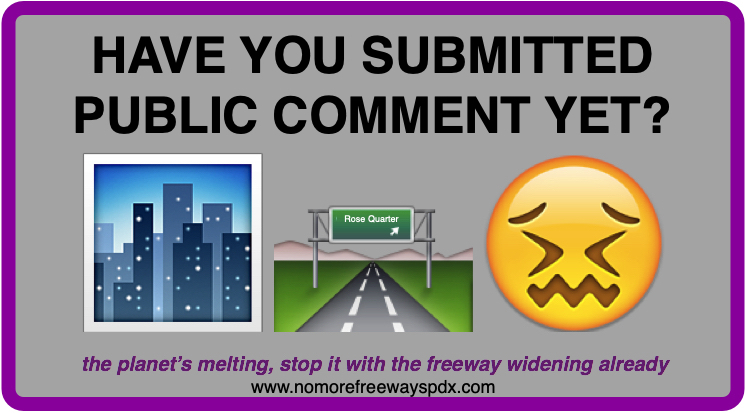 Have you submitted your public comment yet? – Willamette Week covered Joe Cortright’s research showing the massive demographic discrepancies between who drives on the freeway and who breathes the polluted air nearby. 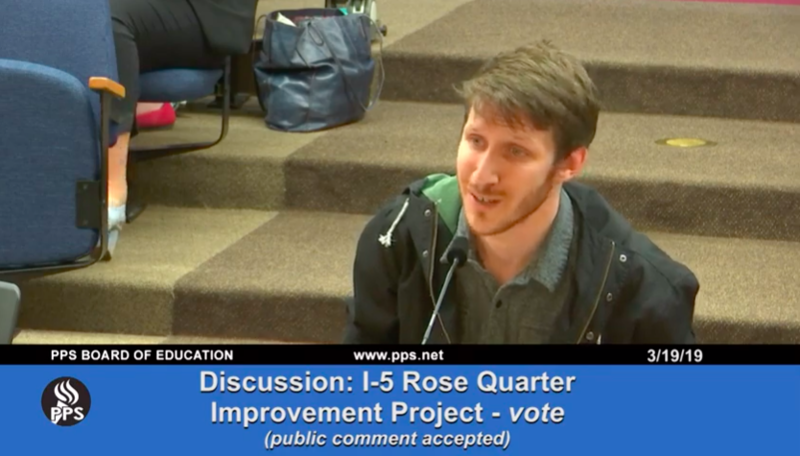 A plan to widen Interstate 5 in the Rose Quarter could produce thousands more tons of greenhouse gas emissions a year, according to a local think tank. 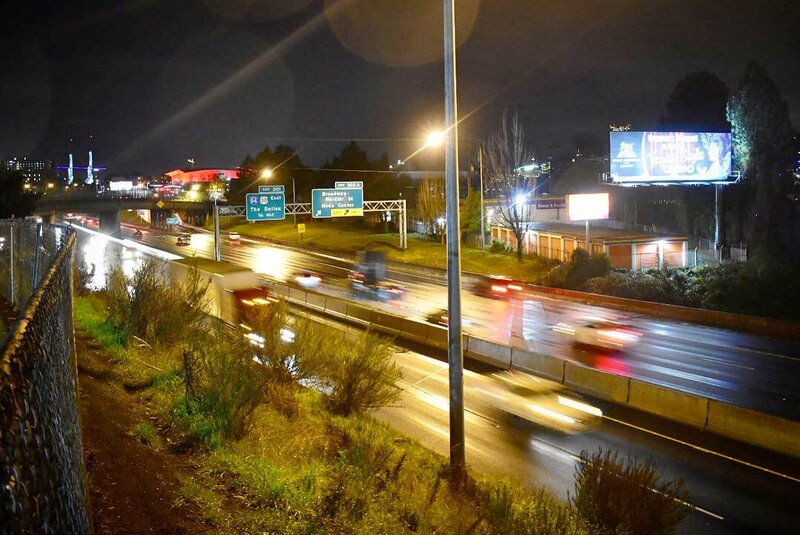 If enacted, the Oregon Department of Transportation (ODOT) Rose Quarter Improvement Plan will add two additional lanes to I-5 in the Rose Quarter area, equaling about 1.6 miles of new freeway lanes. 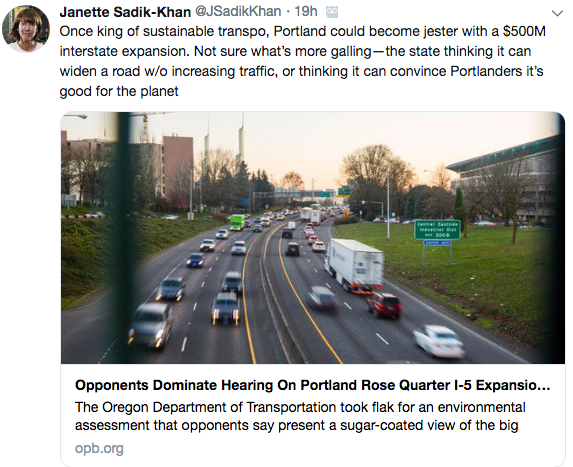 According to analysis by Portland city planning think tank City Observatory, that could lead to 17.5 million additional vehicle miles—that is, the amount of miles driven by cars in a particular area—each year. – Published in the Portland Mercurylast week. 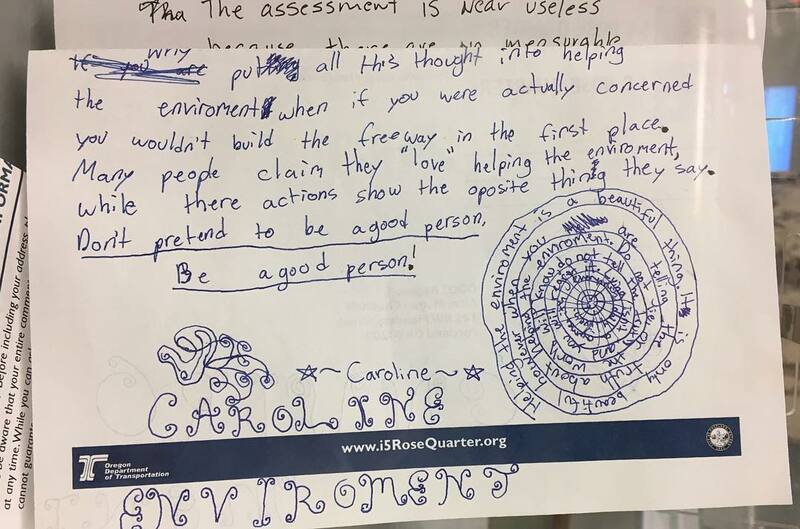 – A fantastic letter to the editor published in The Oregonianfrom Susie Kassouf in Southeast PortlandWe were on XRAY in the Morning on Thursday, March 7th, and we’ll be on the Heather McCoy show on KBOO at 10am on March 14th (apologies for those who tuned in last week – KBOO double-booked themselves!). 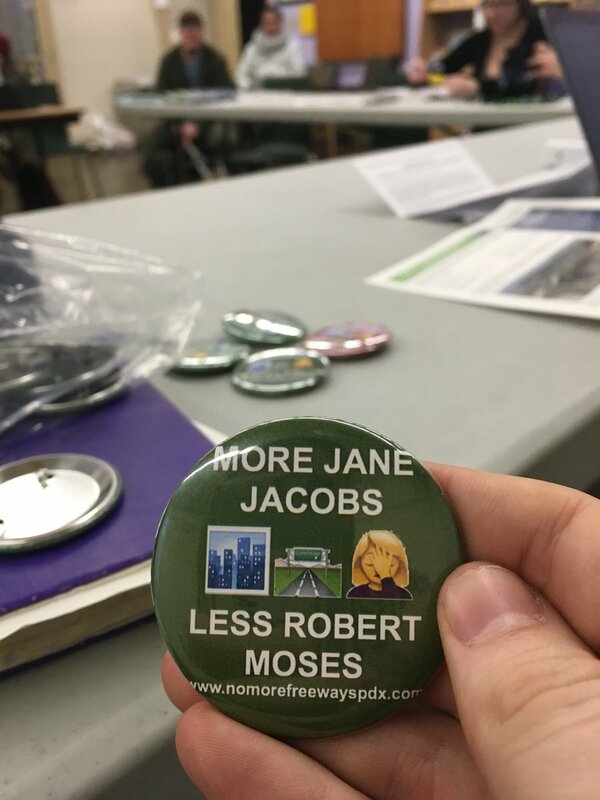 We celebrate #InternationalWomensDay by highlighting the work of Connie McCready and Marjie Lundell, who successfully fought freeway expansion in Northwest Portland in the 1970s, published in BikePortland in 2016. New swag! Same fundraising ask! 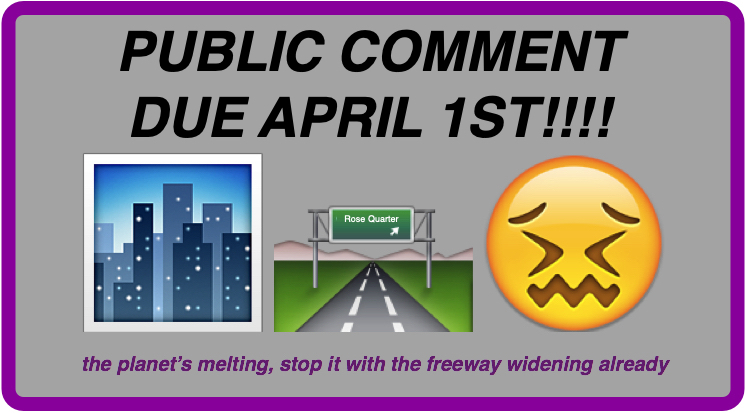 The public comment period closes April 1. That’s three weeks from today! 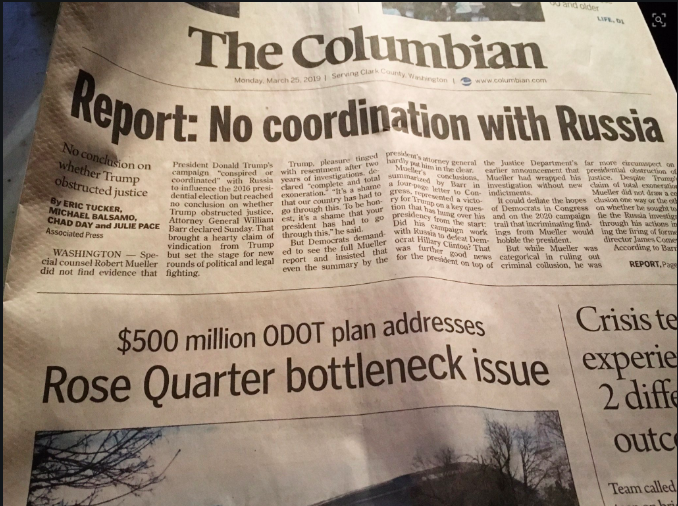 That’s all the time we have left to get comments from every community members, letters from nonprofit advocacy organizations, statements from elected officials, academic documents highlighting air quality/climate/transportation research, and technical analysis of ODOT’s dubious claims into the. Every dollar you donate from here on out helps us put out posters, promote our campaign online, and solicit every possible word we can get on the record. We’re excited for this public comment period to end and for the chance to mail y’all all the buttons, magnets, and copies of Sarah Mirk’s zine on our campaign that you could possibly want. Thanks for your help on this final push! We’ve solicited nearly 200 comments in the last week. 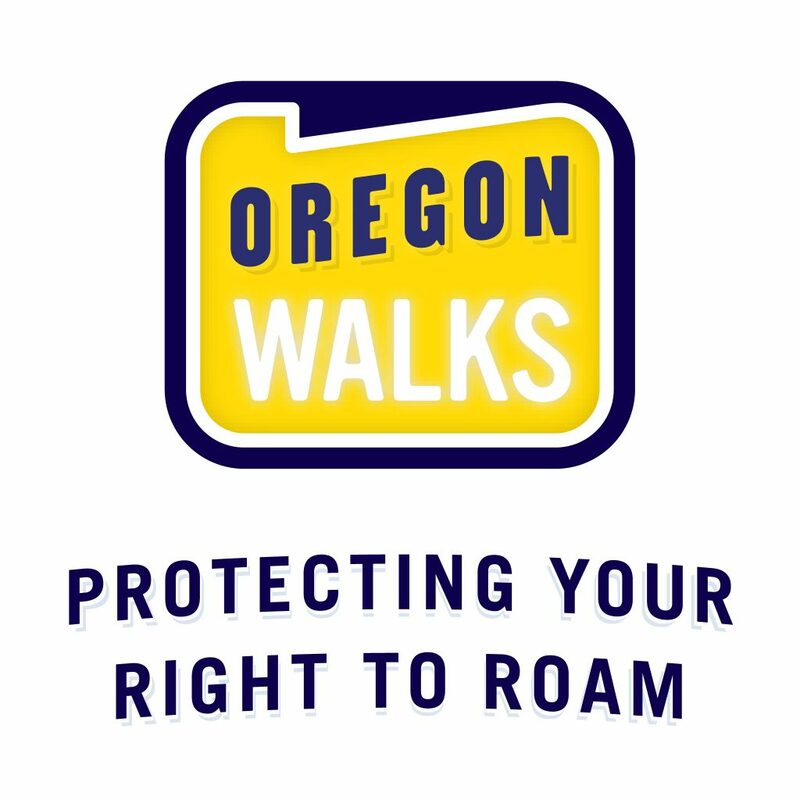 Thanks to our pals at 350 PDX, Oregon Walks and the Community Cycling Center for sharing information about our campaign. You can click on the big button above or on this link here to submit comments online. We’ve provided a script and some talking points, but honestly, write from the heart about your own reasons to oppose this project – that’s as good a testimony as any we could ask for. 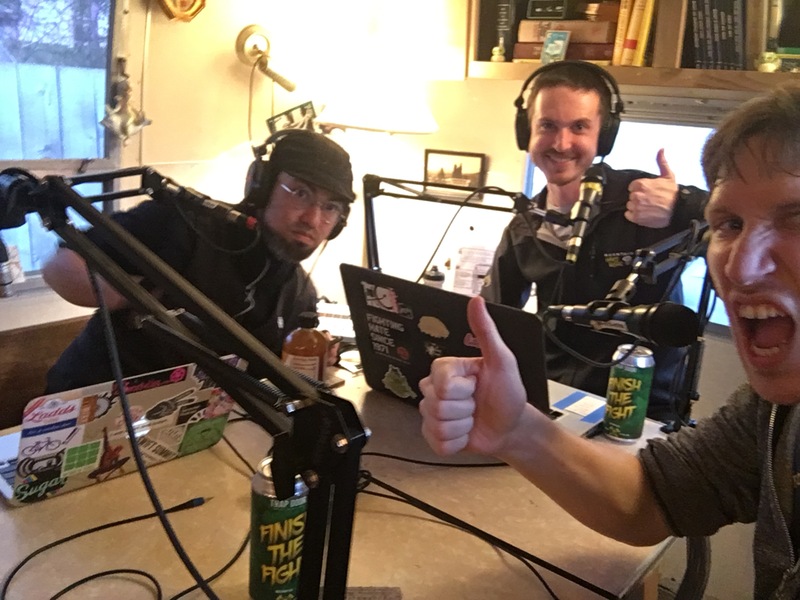 Wednesday, March 6 – BikePortland.org Wonk Night Want to get deep into the weeds and look over some of the specific nerdy details of the project? BikePortland.org is hosting a Wonk Night to look over the specific details of the Environmental Assessment. Event starts at 6:00pm at Lancaster Engineering. Thursday, March 7 – ODOT’s Open House. Starts at 6:00pm at the Leftbank Annex Building. We’ll be there to hand out information about our campaign and encourage folks to testify in opposition to the project. Join us! 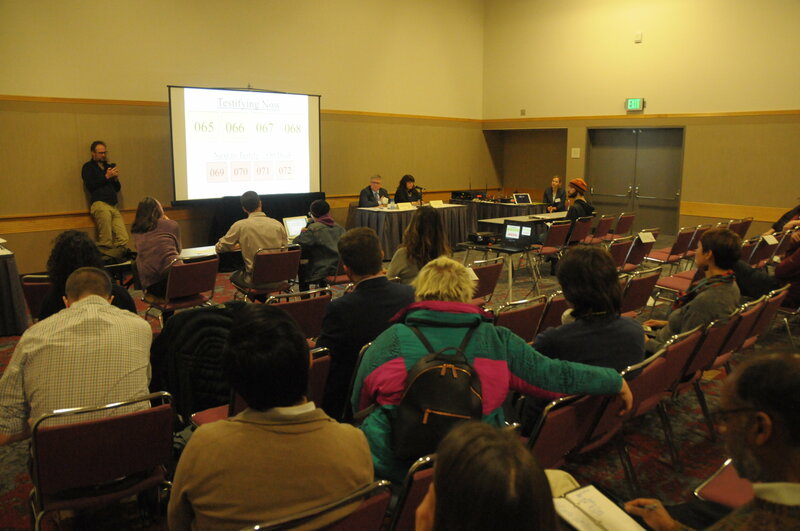 Tuesday, March 12 – Public Comment Hearing Join us at 4:00 at the Oregon Convention Center for our press conference. We’ll be signing folks up to testify at 4:30, and the public hearing itself begins at 5. This will be the big, can’t-miss advocacy event of the month; hope to see you there! RSVP and invite your friends to join you on facebook. Spread the word! For the past two weeks, our wonderful campaign volunteers have been pouring over the data provided by ODOT in the Environmental Assessment. 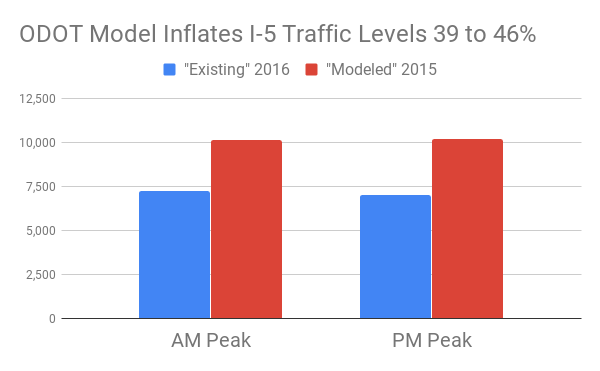 We were hoping to look at the arithmetic that went into ODOT’s traffic modeling – unfortunately, numerous appendices and data figures that are crucial for us to independently verify these claims have not yet been available despite the EA being published two weeks ago. 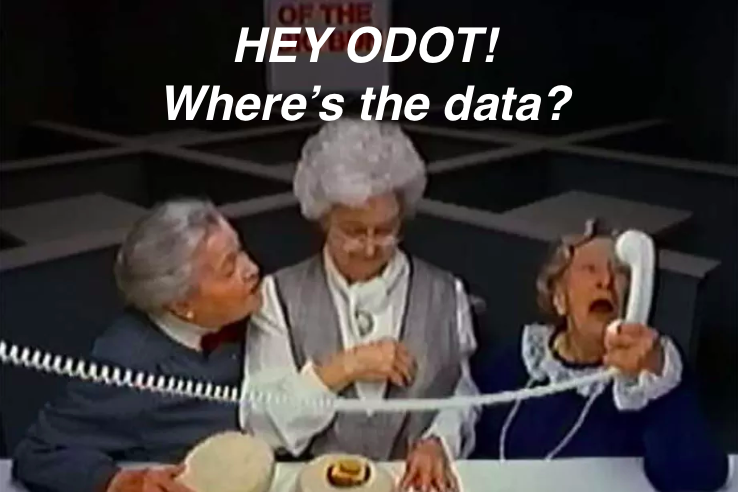 We wrote a letter this week asking ODOT to please provide with us a handful of specific data sets, appendices, and clarifications on their projections. Stay tuned! Press Coverage of our campaign! 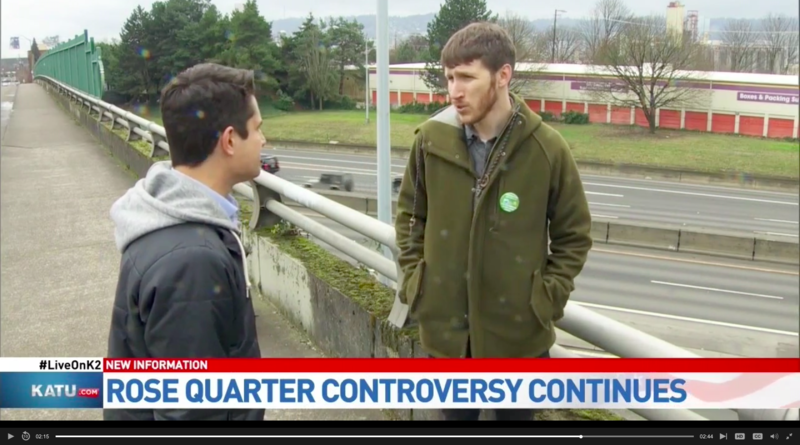 – We spoke to reporters at KATU News at the Flint Avenue Bridge. 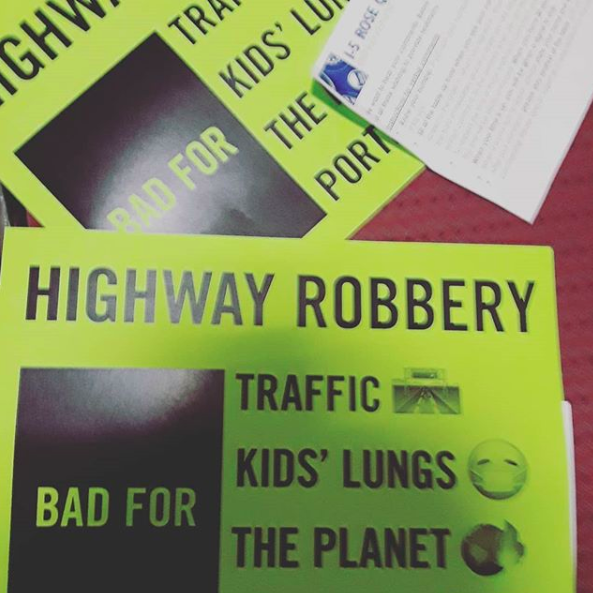 – The Portland Mercury had a great piece on the impacts to Harriet Tubman Middle School, pointing out the concern that Tubman parents felt about the air pollution already on the campus.“A coalition of nearly three dozen Portland neighborhood groups, nonprofits, business and environmental justice advocates denounced a report released last week asserting the proposed Rose Quarter freeway project would reduce travel times, air pollution and carbon emissions. 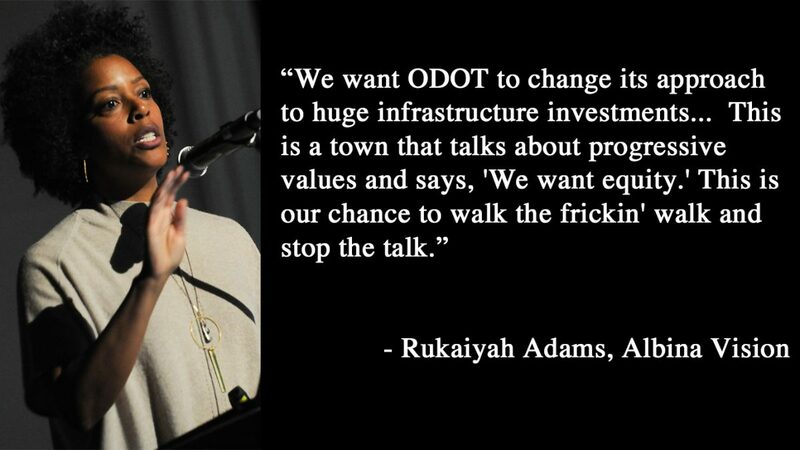 – The Oregonian covered our response to ODOT’s disingenuous Environmental Assessment statements. 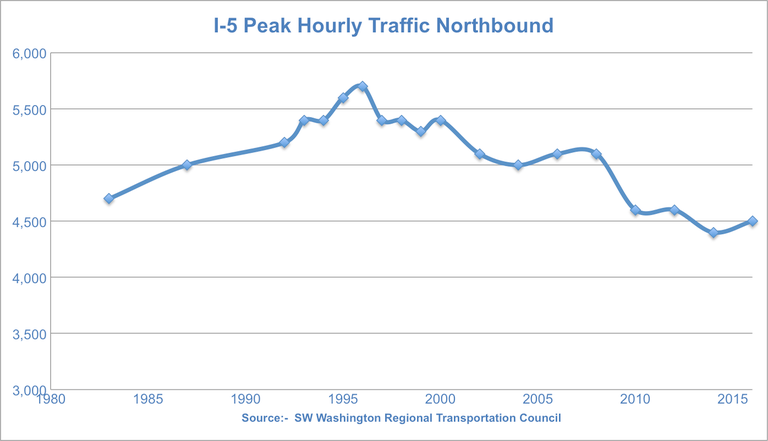 – City Observatory wrote about how ODOT widened a stretch of I-5 less than a decade ago, promising it would reduce crashes and improve travel times. Guess what? It didn’t do either of those things, and the project came in wildly over budget. Thanks to the dozens of you who have donated anywhere between $10 to $150 over the past few months. Every donation goes directly towards our propoganda funds. 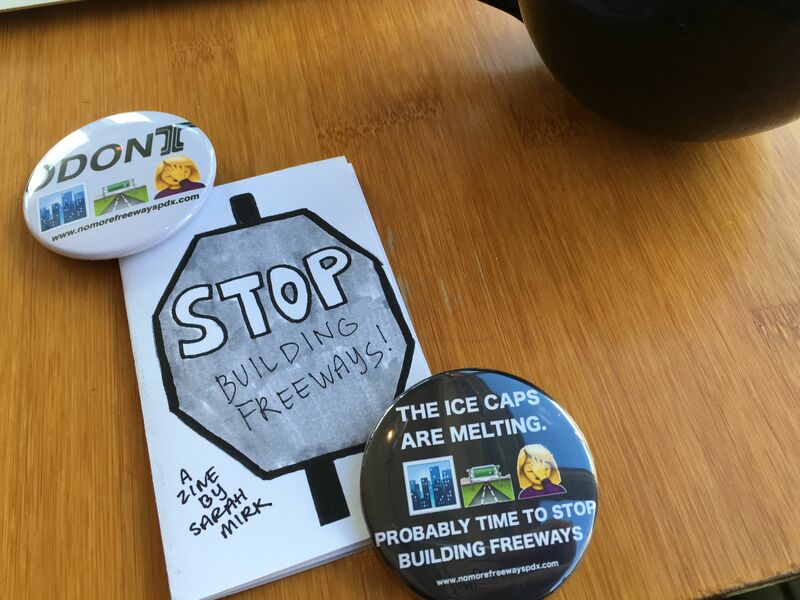 We’ve got some big plans for the public hearing on March 12 and each small donor gets us a little bit closer to covering our costs for all the stickers, posters, signs, and campaign rabblerousing we’re undertaking.Donations are tax-deductible, and we’ll mail you a nice card and some buttons after this whole EA process is over. We’re thrilled to have you on our side. It’s finally here! 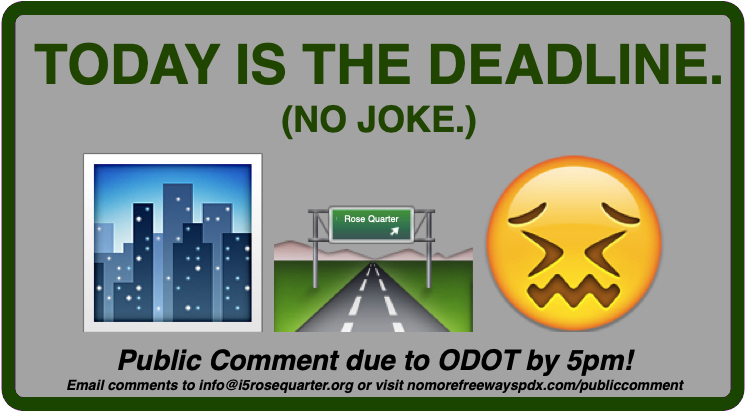 Last Friday, the Oregon Department of Transportation officially released their Environmental Assessment for the $500 million, 1.8 mile freeway widening project through North Portland’s Rose Quarter. 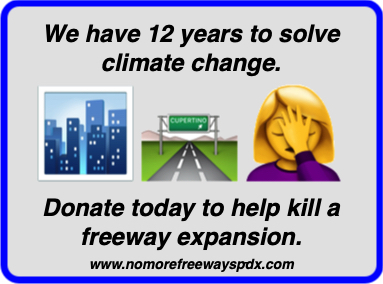 This document is filled with ODOT’s quantitative assertions that building this half a billion dollar freeway expansion will somehow result in reduced carbon emissions, improved air quality in the neighborhood, and a reduction in traffic congestion. This seems…highly improbable, given the decades of research that exist linking freeways to poor air quality, carbon emissions and induced demand for more driving. We’ll be spending the next month going through the Environmental Assessment to factcheck these dubious claims (to the extent that we can: the EA released last Friday is lacking numerous appendices and data sets we’ll need to do our own math). We wish we had more than 45 days to review this document, but ODOT denied our request for a two month extension we issued last November. 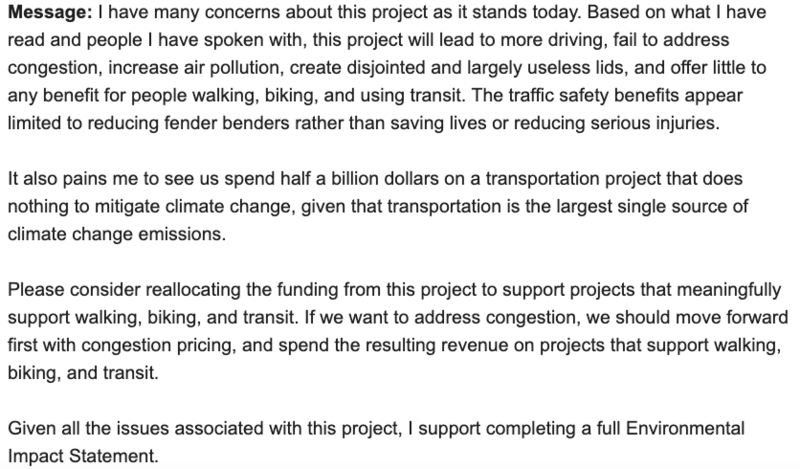 Our letter was co-signed by 35 nonprofit organizations, small business owners, elected officials, environmentalists and neighborhood advocates, who agreed that ODOT needed to give us more time to review this complex, technocratic document. We’re setting up a page on our website to make it easy for community members to log their concerns about this project. We hope you’ll spend some time in the next month joining us in submitting testimony against this project, and that you’ll help spread the word to your peers, colleagues and friends. We’re going to need every ounce of your help. Click HERE to check out our public comment page. 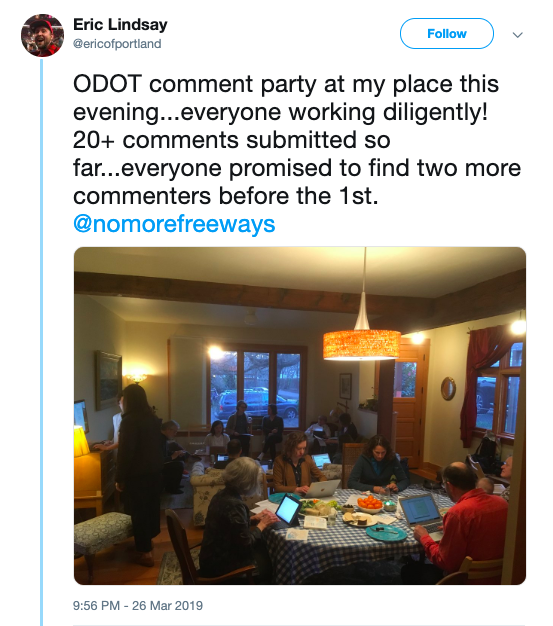 In addition to submitting comment on the record, we need people to turn out for ODOT’s public hearing and the open house. We’re also hosting a volunteer meet up *tomorrow* at the AORTA office in Union Station, if you’d like to get more involved in the next month. Save these dates – we’ll have more information on the open house / public comment soon. Hope to see you there! 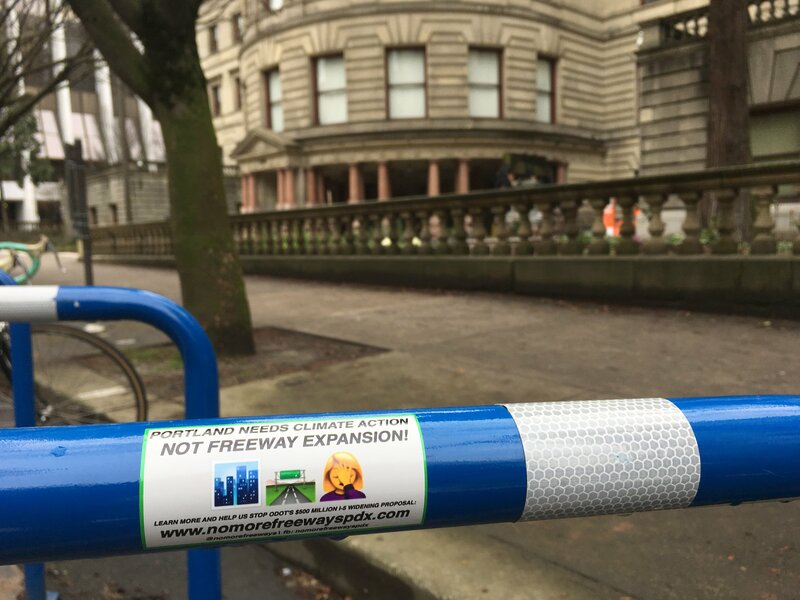 Thanks to BikePortland for publishing our most recent op-ed, and thanks to OPAL – Environmental Justice Oregon, 350PDX and Neighbors for Clean Air for adding their names to our cause. TELL TEN FRIENDS: Who are the ten friends of yours who care deeply about climate change that may not know about this project? 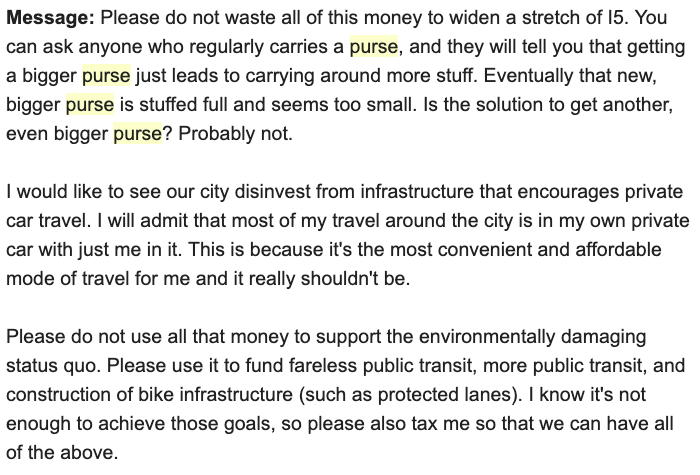 The colleague who is always talking your ear off about air quality, your neighbor who is always muttering that they wish transit was free? Please, forward them our email, encourage them to sign up for our updates. This sort of grassroots outreach is how we’ve raised over $12,000 to wage this legal fight, got more than 3500 followers across our platforms, and submitted thousands of comments to the public record as this project winds through municipal government. Please: talk about the need to stop freeway expansion with your PTAs, your neighbors, your colleagues. Send them our way!DONATE: We’ve got some big public hijinx planned, and the size and scale of them is just a matter of how much we can get donated. Every dollar counts! Donate more than $10 and we’ll eventually send you some of our new stickers and a few political buttons. Donations are tax-deductible. SHOW UP: Come to our volunteer meeting tomorrow (Wednesday, 2/20) and save the date for the public hearing on March 12.